Mergers. Layoffs. Budget cuts. Gamesmanship. Competitive threats. Navigating our careers takes savvy. Having a seasoned thought partner from time to time is a wise option. Knowing when to hold ’em & when to fold ’em separates the women form the girls and the men from the boys. Principal Marianne Fleischer advises leaders and rising stars on Leadership, Talent Development, Learning & Development, Executive Communications–and Marketing Communication. Counsel spans everything from Executive Coaching a CEO during a long controversial merger to advising an agency director on a key one-off strategic with a difficult board member meeting. The San Francisco-based private practice advises rising star VPs, Directors and Managers–not just CEOs. Learning & Development and Marketing Communication projects range wide. We fly to industry venues and offer “just in time” counsel an hour before a leader walks on stage. We rewrite websites, taglines, copy and speeches. We create Show Flow for a 3 day offsite retreat and create internal Speaker’s Bureaus. Part of every strategy involves grooming spokespersons to speak confidently about mission and motivate change. The right Leadership Communications coaching propels workforce engagement for organizations OR clear, motivating direction for entrepreneurs, consultants and small business owners. In any Fleischer Communications engagement, strategic counsel comes first. Digging deep to understand client goals, we then craft creative, experiential Professional Development training and Improv games or competitive marketing campaigns. At Fleischer Communications you always work with the principal & founder. 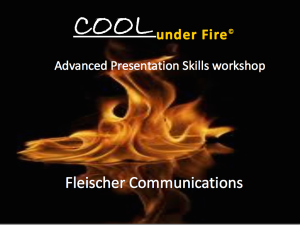 Beyond strategy, specific Fleischer Communication DELIVERABLES may be Speech Coaching for a key industry speech, Cool Under Fire workshops for Performance Improvement training and writing-producing communications in all media (print, online, video, or LIVE events).